I am not sure how to construct the runners for drawers. It will be a five drawer chest. the sides will be made from 3" boards and 1/4" inserts. I want it to be a shaker looking chest. Your help is appreciated. The drawer runners can be fastened into a shallow groove in the sides of the case. The front of the runner can be joined to the drawer divider with a mortise-and-tenon joint. For greater strength of the case and the runners, a second drawer divider can be fit into the back of the case and the runners joined to it as well. The two dividers and two runners joined with a mortise-and-tenon create a web type framework to add rigidity to the case. 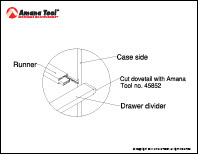 To cut the sliding dovetail that joins the divider to the case I recommend the Amana dovetail bit no.45852. The upper ball bearing will allow you to use a jig to guide the router.